The German island of Helgoland is shown. Lobsters are not the most pleasant of creatures. "They are cannibals and behave aggressively towards one another," says Heinz-Dieter Franke of the Biological Institute Helgoland (BAH). Unfortunately, that adds complexity to efforts to boost their dwindling populations. 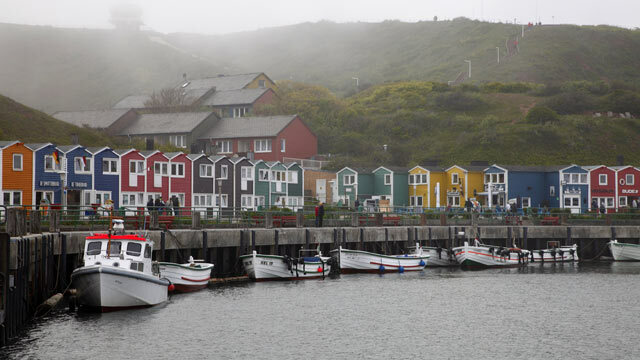 For centuries, lobster fishing was a thriving industry in Helgoland. In the 1930s, some 80,000 of these large marine crustaceans were caught here per season, but the local lobster population was decimated by World War II. Researchers believe that vast quantities of toxins flushed into the sea when the island was heavily bombed and mined during the fighting damaged the lobsters' sensitive sense of smell, which affected reproductive patterns. "Since then, the population has remained stable but extremely low," explains Franke. Further obstacles to their survival rates include a rise of more than one degree in the temperature of the sea around Helgoland over the last forty years, as well as increasingly mild winters. With lobsters having difficulties mating, the local fishermen are netting merely 300 and 500 of them a year. Laboratory scientists are therefore exploring ways to artificially breed lobsters. Female lobsters caught by the fishermen can produce up to 50,000 fertilized eggs. Once they have matured out of the larva stage, the crustaceans are stored in the BAH's freshwater breeding tanks. Thin plastic walls ensure that each creature has its own compartment -- otherwise their cannibalistic tendencies would get the better of the project. In the last 10 years, the scientists have bred over 10,000 lobsters. Once a year, the young lobsters are released into the ocean. But it still isn't enough. Despite the BAH's best efforts, Helgoland's lobster population is struggling to survive. Franke and his team have calculated that some 250,000 lobsters would need to be bred over a period of five years to replenish the island's lobster population. But breeding and feeding the crustaceans in their individual compartments is a time-consuming undertaking, and the BAH estimates that it would cost €1 million to achieve this target. "An institute of our size is not equal to this task," says Franke. But so far, it has failed to identify funding sources, even though he is optimistic that it makes commercial sense. "Were the project to succeed, fishermen would be able to catch 30,000 to 40,000 lobsters per year and that would mean the investment had paid off," he says. But given the long-term nature of the project, he understands why sponsors are hard to find. It takes lobsters eight years to reach sexual maturity, so it will be some time before Helgoland's lobster pots are full again. But Franke and his colleagues are hoping to attract funding with a new approach. They are planning to boost the island's populations not only on its bedrock but also in the offshore wind parks currently under construction off the North Sea coast. The scheme will kick off in the Borkum Riffgat offshore wind farm now under construction some 15 kilometers to the northwest of the island of Borkum on the German-Dutch border. Because the wind turbines are relatively close to the coastline, project owner EWE has to pay compensation to the state of Lower Saxony for damaging the ecosystem. A total of €700,000 of this compensation is now being funneled into the BAH's 3-year pilot project, and 3,000 lobsters are set to be released this year into the sea at the foot of the wind turbines. Crucially, lobsters' survival depends on a firm seabed, which is a rarity in the silt of the German Bight. Fortunately, some of the foundations of the 30 wind turbines are protected by rock fill which serves as an ideal habitat for the fledgling lobster populations. Initially, just four of these rock piles, which span 400 to 500 square meters, will double as lobster habitats. The scientists calculate that each square meter can provide a home to up to five lobsters. Lobsters play an important role within the North Sea's ecosystem. As omnivores, they top the food chain, thriving on algae, mussels, snails and worms and ensuring that other species never get out of hand. The BAH researchers will research whether the lobsters will eat each other in the restricted confines of the wind turbine foundations. But Franke is optimistic: "Lobsters recognize one another by smell. Once they have tested their strength against one another, they accept the results."